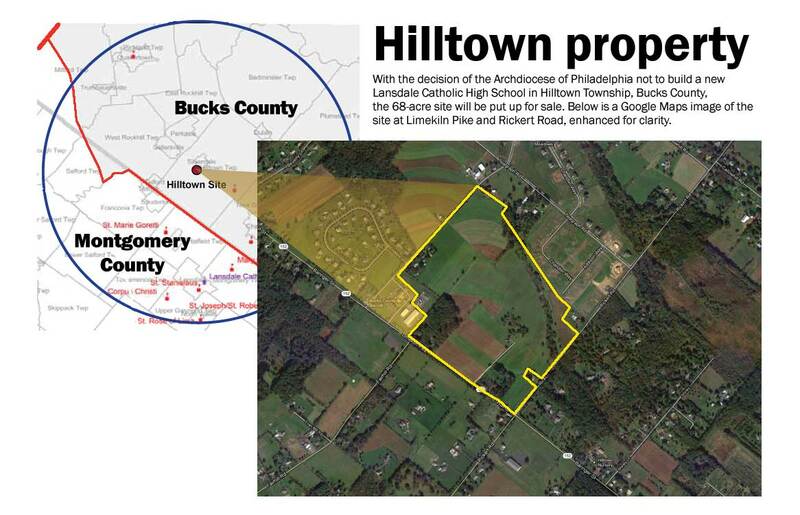 The Archdiocese of Philadelphia and the Office for Catholic Education have decided not to move forward with the construction of a new school for Lansdale Catholic High School in Hilltown Township, Bucks County, the Archdiocese said in an Oct. 23 statement. Parents were notified the previous day. The new school, to be renamed Lansdale Catholic Regional High School, would have been on a 68-acre tract seven miles from the current school which was purchased by the Archdiocese mostly in 2001. The plan for the new 1,200 student school was originally announced in 2007, with groundbreaking projected for 2010 and occupancy in September of this year. Lansdale Catholic traces back to Little Flower High School in Lansdale, a parish high school opened by St. Stanislaus Parish in 1949. In 1960 it moved to its present location as an archdiocesan high school and the name was changed to Lansdale Catholic High School. Enrollment, which is currently 765 students, has been fairly steady over recent years, according to school president James W. Casey. “I’m grateful for the resolution of this and we look forward to being a vibrant part of the community for the next 60 years,” said Casey, who has been president since 2008 and development director for almost two decades before that. As it is, Lansdale Catholic has not been standing still. Among recent improvements are an upgraded technology infrastructure to provide wireless access throughout the school; a renovated Resource Center for iPad, iPhone and Netbook use; a refurbished floor and new bleachers in the gymnasium; sound and stage lighting upgrades in the auditorium; new student lockers on two floors, refurbished weight rooms and athletic locker rooms, a repaved parking lot and a new LED outdoor sign. Am I correct that the money for building at this new location was raised as part of the Heritage of Faith Campaign (along with building Pope John Paul II HS)? If so, how will that money be reallocated?